Orijen has a very loyal following. It’s easy to understand why – the ingredients are fantastic. 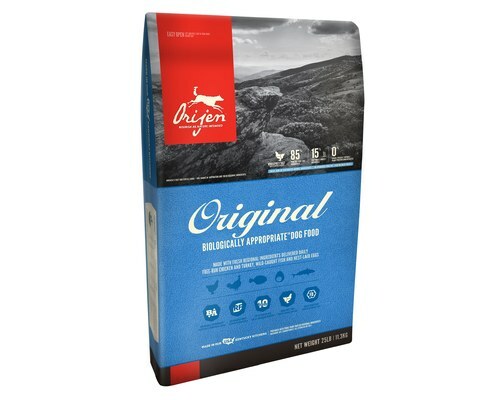 It boasts one of the highest protein and lowest carb percentages of any dry pet food. 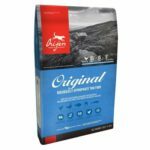 The Canadian manufacturer Champion Petfoods boldly claim to make “The World’s Best Petfood”, and in our opinion they’re definitely up there with the best. Orijen hit our shores this year (2019) but some will remember it being on our shelves just over 10 years ago. Unfortunately the brand ran afoul of stringent Australian quarantine regulations and harmful irradiation, which is thankfully not the case today. Orijen is imported by the same company who import Taste of the Wild, and the products are not irradiated on import. What’s great about this food is they use whole prey. Deboned chicken is the whole chicken, inclusive of organs, just without the bones. This is so much better than many pet foods in which the chicken content is whatever can’t be sold for human consumption (so mostly carcass). I task you to find another dry dog food in Australia which boasts such an incredible ingredients list. Meat, fish, and eggs amounts to 85% of the product, 15% vegetables, fruits, and botanicals, and 0% grains, potato, tapioca, or any other fillers. That’s very impressive, and if all dog foods had ingredients like that we’d likely have a wonderfully healthy dog population. The range of lentils, beans, peas, and chickpeas would make a vegan salivate, and the plethora of fruits and vegetables would put a farmers market to shame. There are no artificial substances, antioxidants, or preservatives in the product. It’s simply all good. Brilliant – if you can afford it. Deboned chicken, deboned turkey, yellowtail flounder, whole eggs, whole atlantic mackerel, chicken liver, turkey liver, chicken heart, turkey heart, whole atlantic herring, dehydrated chicken, dehydrated turkey, dehydrated mackerel, dehydrated chicken liver, dehydrated turkey liver, whole green peas, whole navy beans, red lentils, chicken necks, chicken kidney, pinto beans, chickpeas, green lentils, lentil fiber, chicken fat, natural chicken flavor, herring oil, ground chicken bone, chicken cartilage, turkey cartilage, dried kelp, freeze-dried chicken liver, freeze-dried turkey liver, whole pumpkin, whole butternut squash, kale, spinach, mustard greens, collard greens, turnip greens, whole carrots, apples, pears, pumpkin seeds, sunflower seeds, zinc proteinate, mixed tocopherols (preservative), chicory root, turmeric, sarsaparilla root, althea root, rosehips, juniper berries, dried lactobacillus acidophilus fermentation product, dried bifidobacterium animalis fermentation product, dried lactobacillus casei fermentation product.